Four friends plan a weekend away at their once favorite ski resort. The group quickly realize that the once happening ski resort city has taken a serious turn for the worse. Trying to make the best of their weekend, the group decide to make use of the hot tub in their hotel room. Which just so happens to be one hot tubbing experience that none of them ever expected or will ever forget. With a title like "Hot Tub Time Machine" it is pretty hard not to chuckle and think what the hell is this? Thankfully, the time traveling buddy comedy is well worth the price of admission. The comedy is easily the hardest I have laughed in a theater this year, not to mention most of last year as well. What makes the film work so well is its ability not to take itself too seriously. Let's be straight, we've seen time travel done before and done well, but in comedy and with a Hot Tub? Surely this concept could have some people scratching their heads wondering if they should even bother. I'm here to tell you, you most definitely should bother and you won't regret that decision in the slightest. Scriptwriters Josh Heald, Sean Anders and John Morris deserves a ton of credit for penning such a enjoyable and nostalgic time traveling comedy. In "Hot Tub Time Machine" the four friends played by John Cusack, Craig Robinson, Rob Corddry and Clark Duke are sent back to the year 1986. Without giving away any further details or laughs, having the guys travel back to the 80's makes for a Easter Egg bonanza of memories. Those of us who grew up in the decade are sure to find multiple homages that both tickle the funny bone and provide some memorable nostalgia. Those they did not grow up in the decade, don't worry, the buddy comedy still delivers great laughs and will easily leave its viewers with a new found admiration for the cherished decade. Being a time travel comedy that has a destination circa 1986, it is absolutely priceless that John Cusack plays one of the four friends, Adam. Cusack and the 1980's are like peanut butter and jelly, they just go together. 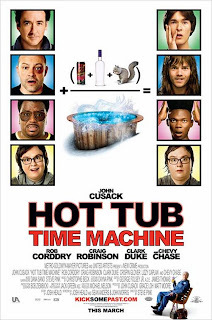 Not only is Cusack a ton of fun in "Hot Tub Time Machine" but so are the rest of the talented comedians within the cast. Especially Rob Corddry and Craig Robinson. Robinson has more than a few great deliveries and comedic sequences that kept me in stitches throughout. Including one in which he makes a phone call that is sure to have everyone laughing. Rob Corddry's character Lou, is beyond outlandish. However he evokes an undeniable charm that ends up making his rough exterior and crass humor seem not as abrasive and all the more hysterical. Clark Duke, who is quickly making a name for himself is also funny, but he is given very little to do outside of playing off the rest of the cast's jokes as Jacob. I really like Clark Duke, but one avenue of his persona that is quickly draining on me, is he plays the same character in everything. Essentially Clark Duke plays Clark Duke. He brings absolutely nothing new to the table. Again, I am a fan of Duke, but if he continues to just play himself I could quickly see his schtick tiring very rapidly. Luckily the script tends to poke fun at Duke's character traits and the banter that develops between him and Rob Corddry is some of the funniest dialogue within the comedy. It would be a sin not to mention a timeless supporting role in "Hot Tub Time Machine." George McFly himself, Crispin Glover. Glover plays Phil, the hotel bellhop and his character is absolutely a riot. Every time his character pops up, it is a real treat for the crowd. Chevy Chase also has a brief yet entertaining role as the Hot Tub repair man. I should also give mention to the radical soundtrack within "Hot Tub Time Machine." I really enjoyed watching music from the big hair band heavy decade play out on screen, especially Rob Corddry and his dashboard keyboard solo, not to mention all the love for the band Poison. There are a few aspects of "Hot Tub Time Machine" that fall flat, but overall the comedy is a laugh-out-loud experience. Like many people I went into the movie expecting very little, I however walked out still laughing and lamenting over all of the hilarity, hijinks and 80's nostalgia. If there is one thing I recommend you do, it's take a trip with the "Hot Tub Time Machine" and be prepared to have a blast.